Over the course of the past year, we have had the distinct pleasure of working alongside visiting scholar Dr. Mônica Vasconcelos, Professor of Pediatrics at Universidad Federale de Minas Gerais in Belohorizonte, Brazil. As a Pediatric urologist, her clinical and research interests lie in the co-occurrence of behavioral problems in children with daytime wetting and bedwetting. A professor at the School of Medicine at Universidad Federale de Minas Gerais, she also has a vested interest in medical education. 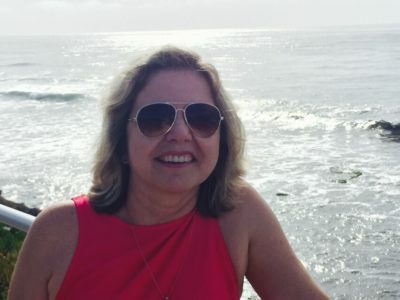 During her time at UC San Diego, Dr. Vasconcelos is working with Dr. Sheila Gahagan’s research team to examine behavioral and daytime/bed wetting data from the Santiago Longitudinal Study as well as collecting data at her own clinic back in Brazil to examine these issues in a current clinical setting. 1). What brought you to collaborate with UCSD? Coming to do sabbatical time at UC San Diego was a plan since long ago. In October 2014, I met Dr. Sheila Gahagan at the AAP (American Academy of Pediatrics) meeting here in San Diego. We talked about my plans for a sabbatical here 2015/16 and working on a research project in Developmental-Behavioral Pediatrics. In June 2015, I finally got a scholarship from a Brazilian Sponsoring Agency (CAPES) to come to San Diego. 2). Tell us about the research project you are working on during your year here as a visiting scholar. In Brazil, I work in a specialized clinic at the University Hospital where I work with children and adolescents with voiding dysfunction. In the last 10 years I have noticed that many children with urinary incontinence also presented with some sort of behavioral symptoms. During my year here at UCSD, I have investigated a cohort of 1,000 healthy Chilean children followed from infancy to adolescence, focusing on behavioral risks reported early in life and the eventual association with urinary incontinence at school age and adolescence. 3). What are some of the challenges and successes so far? In general, moving to a different country, living in another culture and speaking another language is a significant challenge and requires some time to adapt… I can say for sure that in the very beginning every day and every minimal event was a new thing and a discovery (e.g. How to pay the parking, how to fill the car with gasoline, taking an examination to get a new driver’s license, and so on). But at the same time, despite the natural anxiety, each new step brought me a feeling of accomplishment! From the research project perspective, I have been doing some clinical research in voiding dysfunction for a long time, but certainly I had to face the challenge of reviewing and re-learning lots of statistics in order to work on the data here. To the best of my knowledge, this is the first longitudinal study in which there is an attempt to associate behavior symptoms early in life (soon as 6 months of age) with daytime wetting and bedwetting, later in childhood and in adolescence. I believe these findings will help, first the patients, since they will be diagnosed early and treated more adequately. Also, we expect an impact on health professionals who deal with children with these urinary symptoms, because knowing these findings, prevention, diagnosis and treatment will be more prompt and efficient. 5). What have you enjoyed most about your time here as a visiting scholar? Being included in Developmental-Behavioral Pediatrics group and in the Center for Community Health has been such a wonderful experience for me! Since the very first day, I felt myself welcome in this wonderful group! From a professional perspective, being part of a collaborative research team and learning how to support each other in all aspects of the research process has been immensely valuable for me. 6). What are your favorite things to do outside of work? I love sightseeing in San Diego. In Brazil, I am originally from the coast but for a long time I have lived in a big city inland, situated 400 miles from the coast and beaches. Being in San Diego has brought back many memories from when I was younger and lived the coastal life. Walking on the beach! My favorite places are Torrey Pines, Coronado Island and La Jolla Cove. Look for more artistic events, attend more concerts and plays, also visit new places and take more trips. I love to travel!!! 9). What advice would you give to a young clinician and/or researcher? “Imagine your dream, create your happiness, live your life!” Fight for your goals and trust in yourself! Everything is possible, if you really want it. I lived in Davis, California 25 years ago. At that time, my husband was doing his PhD and I had 2 small children and was pregnant with my 3rd. It was a great experience for our entire family, even though sometimes challenging! Since then, I always wanted to come back and live here for a while to do a sabbatical. So, today the dream comes true! 10). Anything else you would like us to know? Sincerely I will miss you all! This sabbatical year here with this group was amazing, an unforgettable time! I am finishing my stay here with the feeling that I´ve gained a lot of enchanting friends, precious memories and fantastic moments. Besides the human experience itself, I also feel that I improved myself professionally and took advantage of different opportunities to better myself as a clinician, professor and researcher that certainly will help me when I get back to Brazil. Thank you all!! !